GLUTEN FREE Pizza Crust – Add you own toppings! Hi, I’m Ana and I love experimenting with all foods! This is a Paleo friendly recipe. Very delicious, Cheesy goodness, satisfying and healthified! In bowl (I used the electric mixer), whisk together tapioca flour, GF flour, garbanzo flour, sorghum flour, xanthum gum, and salt. . In small saucepan over moderate heat, stir together milk and 1/4 cup water and heat until warm for about 1 minute. Stir in yeast and sugar. Add milk–yeast mixture, egg whites, and 2 tablespoons oil to dry ingredients. Using paddle attachment, beat at medium until dough is smooth and thick, about 5 minutes. Remove racks from oven, set pizza stone or use a heavy baking sheet on bottom of oven, and preheat to 400F. Have ready two squares of parchment paper and place half of each dough onto each square and form each into a ball. Coat each ball with 2 teaspoons oil and pat dough down stretching each ball into 9-10inch-diameter round, 1/4 inch thick, with a 1/2-inch-thick border (this will be key). Loosely cover rounds with plastic wrap and let rise for about 20 minutes. Transfer crust with parchment to preheated pizza stone and bake until top is puffed and firm and underside is crisp, 5 to 10 minutes. Discard parchment paper, transfer baked crust to rack to cool. Bake second crust in same manner. Top and broil pizzas with toppings of choice. I used mozzarella, pancetta, fresh tomatoes and fresh basil. Drizzle 2 teaspoons olive oil over the top. Broil pizzas about 4 inches from heat, rotating as needed for even browning, until cheese is bubbling and browned in places and crust is golden brown, 4 to 8 minutes. Scatter with basil, slice, and serve immediately. 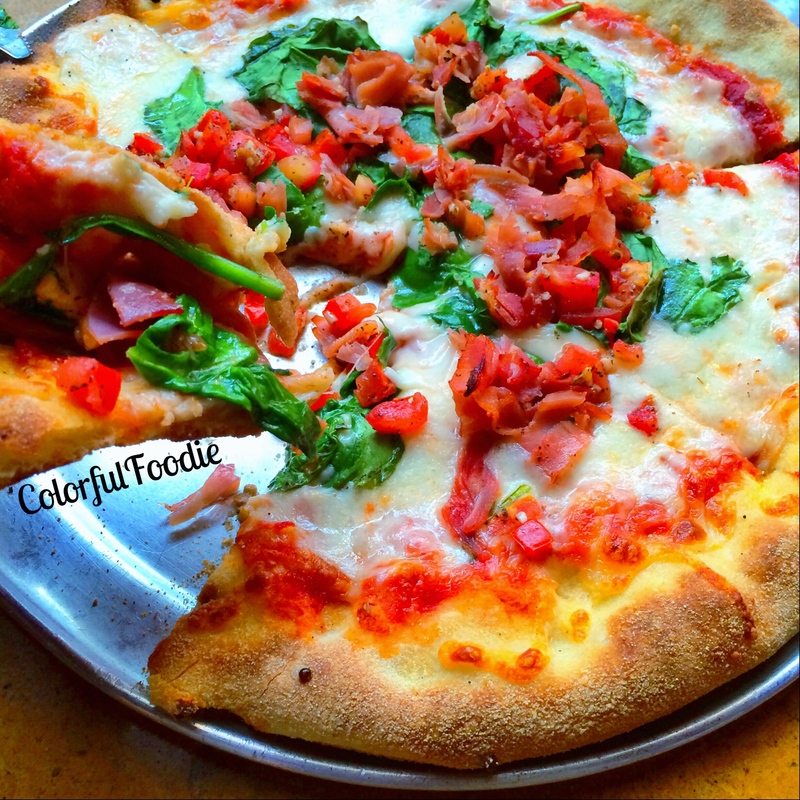 This entry was posted in Dine with me, Healthy Pizzas, Recipes and tagged GF, gluten free, gluten free bread, gluten free pizza crust, glutenfree, healthy pizza, pancetta, pizza crust.